Trottier, Daniel and Christian Fuchs, eds. 2014 [hbk]/2015 [pbk], Social media, politics and the state. Protests, revolutions, riots, crime and policing in the age of Facebook, Twitter and YouTube. New York: Routledge. ISBN (hbk) 978-0-415-74909-1. ISBN (pbk) 978-1-13-879824-3. This book is the essential guide for understanding how state power and politics are contested and exercised on social media. It brings together contributions by social media scholars who explore the connection of social media with revolutions, uprising, protests, power and counter-power, hacktivism, the state, policing and surveillance. It shows how collective action and state power are related and conflict as two dialectical sides of social media power, and how power and counter-power are distributed in this dialectic. Theoretically focused and empirically rigorous research considers the two-sided contradictory nature of power in relation to social media and politics. Chapters cover social media in the context of phenomena such as contemporary revolutions in Egypt and other countries, populism 2.0, anti-austerity protests, the fascist movement in Greece’s crisis, Anonymous and police surveillance. Trottier, Daniel and Christian Fuchs. 2014. Theorising social media, politics and the state: An introduction. 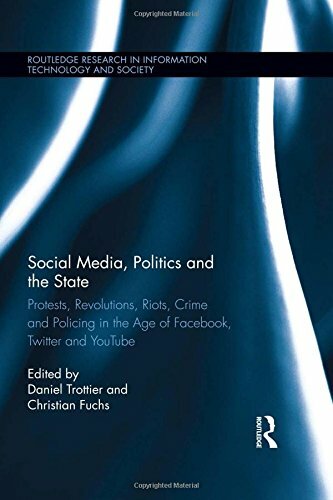 In Social media, politics and the state: Protests, revolutions, riots, crime and policing in the age of Facebook, Twitter and YouTube, ed. Daniel Trottier and Christian Fuchs, 3-38. New York: Routledge.